Trees are major investments that need just as much nurturing as your business. Because of this, there are some financial obligations that are required for commercial tree care. In most cases, a business will incur most of the financial burden when purchasing trees for their landscape. However, commercial tree service does not end after the tree is planted. It is a necessity for trees to receive continuous treatment. By providing ongoing care, your business will continue to receive the dividend payments that only trees can provide. 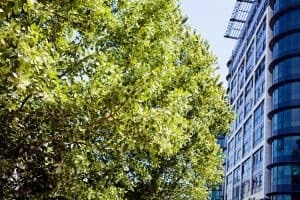 As A Business Owner, Why Should I Have Trees on My Premises? With these potential benefits to your business property, there is no question that you should contact Family Tree Services immediately for all of your commercial tree care needs. Our service area currently includes Buncombe County and Asheville, NC. What Is The Importance Of Commercial Tree Upkeep? After your new trees are planted in the ground, you can expect that over time, they will develop and grow larger in mass. As their size increases, your tree will require a greater amount of commercial tree service. A professional and knowledgeable arborist from Family Tree Services has the ability to effectively prune tree branches, spray for pests and apply nutrients. These services combined will maintain optimal tree health. Keep in mind that as a tree develops over time, there is more risk of tree damage to your property. This risk is a threat to the overall bottom line of your business. Your best defense against such unwelcome possibilities is the institution of a treatment program specifically designed for your particular tree type(s). Depending on the scope of your business, your landscape may offer more than aesthetics. Your landscape, and the trees that occupy it, more than likely also serve to increase the property value. Businesses in Asheville and Buncombe County are similar to other companies in the fact that tree safety is a value in itself. Regularly scheduled commercial tree care services greatly reduce the chances that a limb will fall and cause injury to someone. In the event of inclement weather, commercial tree service will give your trees the strength to overcome nature’s influences. The competent professionals at our company can assess your tree(s) for these and other findings. A thorough assessment will be conducted to determine any necessary actions that will mitigate or remove dangers. If your tree stands in solitude on your property, it is at risk for being struck by lightning. Trees in parks are most at risk. Nature doesn’t care about the fact that you put time, money and care into your tree. Lightning can destroy your tree in an instant. Therefore, Family Tree Services offers protection from lightning strikes through the installation of protection apparatuses. Copper is placed in the uppermost part of the tree and strung throughout the large limbs and tree trunk. In the event of a lightning strike, the electricity is grounded which keeps the tree out of harm’s way. There are many common tree pests that inhabit NC. They are much more than just a nuisance as many have the capability to eat away at the bark of trees. As a consequence, the delivery of water can be interrupted throughout the structure of the tree. An ignored tree can suffer greatly from such pests. As a business owner, depending on your location, you may face USDA fines if your trees become infested. Some insects can disguise themselves while wreaking havoc on the inner part of your tree. Therefore, infestation may be present for a long time before the effects are displayed. To prevent this, make sure that you schedule an appointment with Family Tree Services so that we can apply the necessary spray treatments in an effective manner. You most likely realize by now that caring for your trees is ultimately your responsibility. Failing to look after your trees can result in headaches that can drive down the productivity of your business. However, these are things that you need not be afraid of. While building your business partnerships, be sure that you also partner with Family Tree Services. We’re your tree’s best friend.